Written for the opening of the Kennedy Center for the Performing Arts in Washington DC, its 1971 premiere was a cause célèbre and a pointedly two-fingered salute at Nixon (who, at the instigation of the FBI, did not attend the performance). With the unpopular war in Vietnam and the JFK assassination still haunting the nation, the music of Bernstein's Mass struggles to reassert religious faith against a backdrop of social unrest. The allegory used in this "theater piece for singers, players and dancers" is a priest celebrating Mass who suffers a breakdown at the altar, smashing the sacred sacraments, while raucous blues and rock street singers try to drown out the church music. 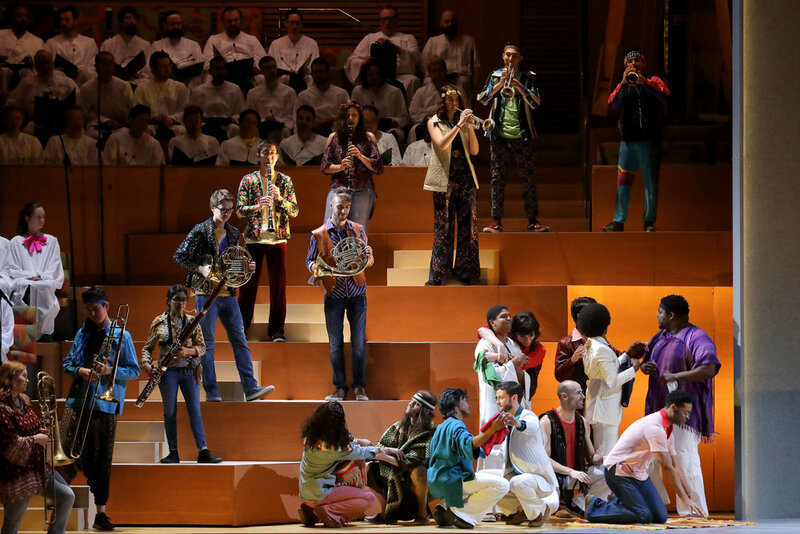 Gustavo Dudamel presided over the Mass with his customary attention to detail and astonishing dynamism, producing an unforgettable theatrical tour de force. The LA Phil musicians should be commended for going out of their comfort zone to deliver uninhibited renditions of Sousa, edgy rock or jazz-like liberation. 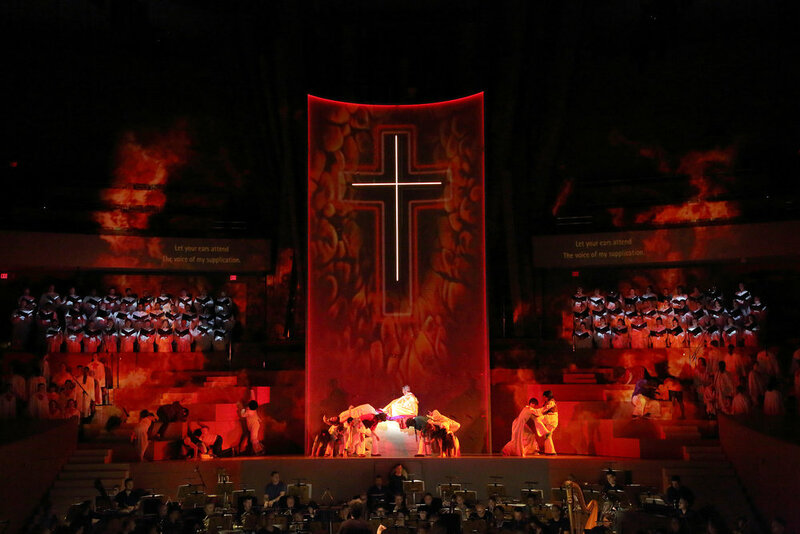 The singers, headed by bass-baritone Ryan McKinny as the priest celebrant, were all topnotch. The robed choirs sitting in the pews comprised the LA Master Chorale and LA Children's Chorus. The 'street people' chorus, in Christine Crook's psychedelically colorful hippie costumes, were as brutally relentless as McKinny's celebrant was serenely spiritual in his "A Simple Song". Soren Ryssdal was a seraphic-sounding high boy soprano. The seven acolyte dancers moved with ritualistic gestures and formations to Laurel Jenkins' choreography. Adam Larsen's video projection and Seth Reiser's lighting also greatly enhanced the theatricality of the show. Like his problematic operetta "Candide", Bernstein's Mass also contains a potpourri of disparate musical styles. But unlike "Candide", the Mass achieves a cohesive fusion of these elements that the operetta never could. In my personal estimation, the Mass is Bernstein's finest work for the musical theater since "West Side Story". Interestingly, a few riffs from the Jets and Office Krupke can be heard in the street people chorus. Bernstein's Mass could find no better proponents than Dudamel and his troupe at the WDCH.